Pulling subsidies as revenge for the $51 bln carmaker cutting U.S. staff and plants – as President Trump has threatened – would be unfair. It might not even be possible. Trouble is GM remains a poster child for government bailouts. It’s a fight its boss can’t easily win. 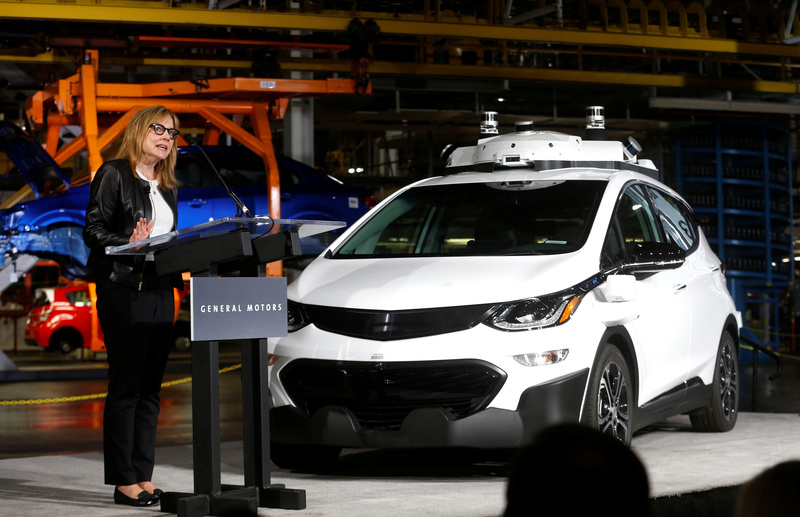 General Motors Chairman & CEO Mary Barra updates auto workers and the media on autonomous vehicles development and the Chevrolet Bolt EV at GM's Orion Assembly plant in Orion, Michigan, U.S., June 13, 2017. U.S. President Donald Trump warned on Nov. 27 that the White House was “looking at cutting” subsidies for General Motors, after the automaker said it would stop production at four U.S. plants as well as one in Canada, a move that would affect some 7,000 jobs. GM is also laying off some 8,000 salaried workers. GM electric vehicles are eligible for a $7,500 tax credit under federal law. The carmaker said on Nov. 26 that it hopes to reduce annual costs by $4.5 billion and capital expenditure by almost $1.5 billion a year. GM plans to double resources allocated to electric and autonomous vehicles by 2020.